Maritime Greenwich includes the Old Royal Naval College, the Queen's House, National Maritime Museum and Royal Observatory, Greenwich Royal Park, the Ranger's House and the historic town centre. Many of its buildings are by the greatest British architects of the 17th and 18th centuries, and as a whole the Site is a unique historic townscape. Equally important, it embodies themes of great historical significance: as a major royal site under the Tudors and Stuart monarchs; as the home of ground-breaking astronomy and 'Greenwich Time', through the 300-year role of the Royal Observatory in improving navigation and global time-keeping; of the former Royal Hospital for Seamen, later the Royal Naval College and now a modern university campus; of Cutty Sark, the last great tea clipper; and of the world's pre-eminent maritime museum. Greenwich is part of London, but actually more a kind of village to itself. Going there via the Dockland Railway you pass glittering skyscrapers and modern industrial scenery. The National Maritime Museum is one of the attractions here: large, with well-presented exhibits. Next door is the Queen's House, a small white building where you really have to see the inside (lovely rooms!). On the hill behind these two buildings is the Royal Observatory - another must see. 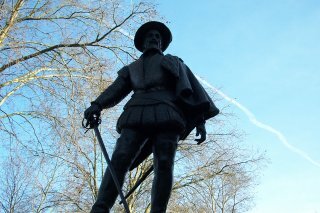 Besides these monuments, Greenwich is also a very attractive place for a walk. The distances are not big, and there are things to see in almost every street. The whole village has a good atmosphere. I found it a great destination for a weekend trip. I visited this WHS in June 2013. I used the underground and walked by the Cutty Sark, the Naval College, the Discover Greenwich information centre and up to the Royal Observatory and Park. The museum is very interesting and helps you appreciate the site better. I took a quick photo on the prime meridian line and saw the red ball drop at around 11:30. An interesting half day trip from London City Centre and it certainly deserves WHS status. Greenwich is the name that commonly appeared since one of the first things that travelers normally do before travelling aboard is checking the differences of local time and the Greenwich Mean Time which is the international time standard, so coming to England and not visit the place is not a wise way to spend time in this country. On my last day in England, I went to Greenwich which is very easy accessible by tube and DLR systems. The village of Greenwich was quite lovely with its rural village styled with many cute shops and restaurants. I walked along the river Thames to see the famous clipper, Cutty Sark, along the way there were many banners of the Royal Borough of Greenwich, celebrating the new royal status bestowed by Queen Elizabeth II last year. 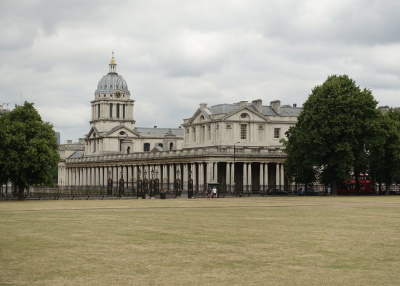 Then I went to the large complex of Royal Naval Collage, I was surprised that most of the people I saw was students of University of Greenwich which I leant later that the university uses the complex as their campus. The complex is designed by the famous Christopher Wren, I really liked his design that separating the complex into four parts with open courtyard in the middle while the Queen's House is located far behind, forming a nice landscape link for all these buildings from River Thames. I was very disappointed that I did not have a chance to see interior of these three buildings due to its closing for renovation. Then I walked uphill to the Royal Observatory to see the mark of Prime Meridian line and the Greenwich Mean Time clock. The observatory building is quite strange with design that does not go well with other part of Greenwich's riverside but it is still fine and interesting, and I did not like the shiny modern addition line on the ground and its futuristic statue, I think they are tourist trap for those who want to stand on both hemispheres in the same time, I prefer the traditional red line painted on building. After adjusted my watch with the actual Greenwich Mean Time, and found out that I only had few more hours in this country, I hurry walked back to DLR station and end my trip for Greenwich unhappily, I really liked Greenwich and would be happy to come back again if I have more time to spend in London. London is one of my favourite cities in Europe and Greenwich is one of my favourite places in London. I've been several times in London, most recently in August 2010, and each time I visited Greenwich. In my view, the Royal Greenwich Observatory is the most beautiful place of the WHS. 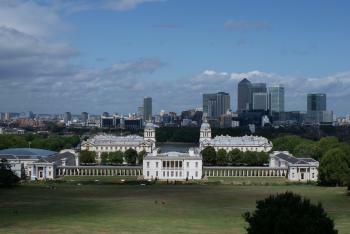 The view from the observatory to the Queen's House, the Royal Naval College, and the modern office buildings on the Isle of Dog in the background is marvellous (photo). On the roof of the observatory a red Time Ball was installed. This ball is still being pulled up every day and falls down exactly at 1 pm. Once the ships on the Thames used this procedure to set their chronometers to the exact Greenwich Mean Time. The problem of exact time measurement and thus the accurate determination of longitude of a ship at sea and how it was resolved is a major theme of the museum. There you can admire the historic marine chronometers by John Harrison. 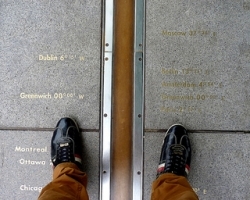 And of course I stood on the prime meridian and took a photo of my feet. 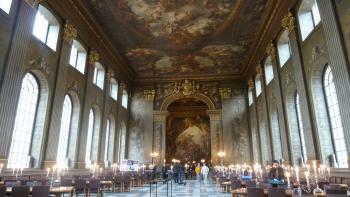 Also worth a visit are the Painted Hall at the King William Building and the Queen's House with the tulip stairs. Part of the WHS is also the lovely centre of Greenwich with its Georgian and Victorian buildings. And it's funny to walk through the Greenwich foot tunnel (not for people with claustrophobia) to the opposite bank of the Thames. There you can enjoy the view from the Island Gardens to Greenwich. Greenwich is a site that truly deserves its listing on the WHS. Apart from being very easy to reach from central London, Greenwich's importance in the fields of science, navigation, and world exploration is really universal. I first went there on a warm summer evening in 2002, when all the buildings were already closed, including the Royal Observatory with the Prime Meridian. It was still a great place for a stroll, but of course I had to return one day to see everything. Over 10 years later, I finally came back to London and made sure to set aside a full day for Greenwich and all its attractions. The first thing you see when you step out from the foot tunnel (recommended because you can see the full panorama from the opposite bank of the Thames) is the former tea clipper Cutty Sark which is really very interesting to visit. The Royal Observatory is a bit uphill in the large park, and you should time your visit to be in the courtyard at 1 p.m. to see the famous time ball drop. You will probably stand in line there anyway to get a chance at taking a picture of your feet straddling the Prime Meridian. 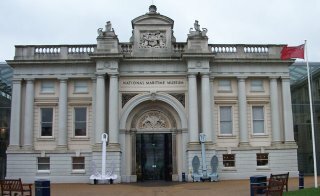 Both the Observatory and the huge National Maritime Museum include very interesting exhibitions on science, navigation, and history. I also visited the Queen's House, the last remaining buiding of the former Royal Palace of Greenwich, as well as parts of the town's historic centre, also part of the WHS. Finally, the Old Royal Naval College with the Chapel and the Painted Hall, something I had missed entirely on my first visit, is an architectural masterpiece by Christopher Wren and definitely a must-see for any trip to London. One day is barely enough to take in everything Greenwich has to offer, and for anybody interested in history, science, and anything related to the sea, this is a fantastic and fascinating destination. This is the third of London’s four UNESCO site’s to be added to the WHC list, and it is one of my favourite parts of the city. The Town of Greenwich (gren-itch) itself is a quaint place and has a much more relaxed atmosphere than the rest of the city. Greenwich was included for both its architecture and its role in the scientific developments. The Old Royal Naval College is the largest building in the site, and provides it’s highlight in the Painted Hall which is features the finest Baroque decorative paintings in Britain and it is breathtaking I must admit. 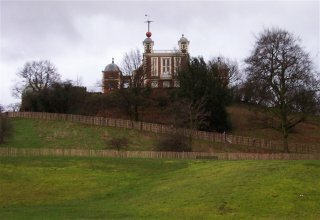 The highlight of the scientific side is the Royal Observatory up on the hill through which runs the Greenwich Meridian which divides the globe into an Eastern and Western hemispheres. The museum here is very interesting especially if you like clocks! And to make things better all of the museum’s here are now free, as most of the world class museums of London now are! The park is a really nice place to sit and relax and there is also the Cutty Sark ship so you should plan on spending at least half a day here to get the best out of it. It is reasonably easy to get out to Greenwich, the Docklands Light Railway runs there from central London (one station next to the Tower of London!) or you can get a boat down the Thames if you want a more relaxed way to get there. I just visited the Observatory. I haven't had enough time to visited the Maritime Museum. I guess listening the story at Greenwich Observatory is very interesting. 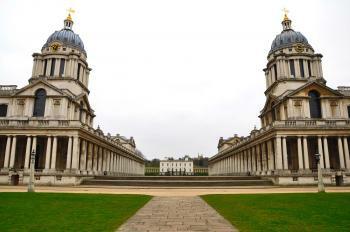 Hospitals: Greenwich Naval College was originally built as the "Royal Hospital for Sailors"
Zero Meridians: Was established 1851 and set as the World's "Prime Meridian" in 1884. Its location is marked in a number of places within the site. Breweries: "There was a brewery on the site of the earlier Tudor Palace, from 1717 until around 1860. The present structure formed part of a brewery of which the function was to supply the retired and injured sailors, who were pensioners of the Royal Hospital, with their daily ration of beer. The current building was built in 1831, substantially altered in 1843. Once a large, three storey building, what remains today is a single storey block with a series of vaults below. " The Mean time Brewing company "in 2010 will be opening the Old Brewery, bar and restaurant with brewery in the original 1836 Brewhouse of the Old Royal Naval College Greenwich, making it only the second brewery in the world to be located within a UNESCO WHS"( Wiki). Peter the Great : Visited the Royal Observatory at Greenwich, observing Venus with the first Astronomer Royal, Flamsteed. Louis XIV: The Painted Hall ceiling contains a representation of him "Below William, clutching a broken sword, is the defeated French king Louis XIV, who wears a yellow tunic, the colour of fear and treachery"
Naser ed-Din Shah: "After continuing a certain distance, we arrived at Greenwich, where is the Naval College of England, and which possesses an imposing palace"
460 Community Members have visited.